Gluten-free and Vegan, this roasted acorn squash mash recipe is a delish and easy side dish! Sundays are my favorite day of the week; a lazy brunch followed by an early dinner, catching up with stuff around the house, friends coming over to visit, and just enjoying life in general. One thing I refuse to do on Sundays is grocery shop. I have to admit that while I love food, I hate grocery shopping, so I won’t taint my favorite day of the week with a mundane and annoying process (yep, that’s how I feel about it). I wish I looked forward to it like some of my friends; they revel in browsing the fresh produce, and gain recipe ideas from just wandering the aisles. Me? Not so much. It seems I always pick the worse time to go to the store, when the aisles are jam packed and I can’t stop to think about the foods I need to get. Babies are crying, employees are blocking the aisles while they restock the shelves, and I struggle with whether I’m buying the freshest produce so it doesn’t spoil in a couple days before I get around to making it. But, I digress. So last night we made one of our most simple and fave Pork Chop recipes, using ingredients we tend to just have around the house, and decided to spice things up a bit with some warm mashed Acorn Squash. I love this time of year, when most all farmers markets and grocery stores are lined with fresh squash varieties, and squash and pumpkin recipes are all the rage online. I’ve found some really interesting recipes online, and last night I decided to add some of the juice from the chops with the squash. The verdict? A happy family! Here’s the recipe for the Pork Chops which inspired the mashed squash. Since the Pork Chops are made with a warm butter and apple glaze, I decided to use a bit of the sauce before it became a glaze, and added it to the squash. If you choose to make the squash by itself, you can mimic the apple, butter sauce which I’ll list in the recipe below. Note I used Ghee instead of butter, and avoid The Vegan butter substitutes as much as possible. If you’re using products like Earth Balance, you may want to do a bit of reading on the ingredients; while some use non-GMO oils, it’s important to note that non-organic canola and soy have a 93 percent chance of being genetically modified. There are a number of studies that show neither are ideal oils for human consumption—organic or not. Canola contains fats that experts say should not be exposed to heat, and canola has been shown to deplete vitamin E levels in mammals, while the plant itself (rapeseed) is an insect repellent and used in industrial manufacturing. Soy oil has been linked to breast cancer and its high levels of Omega-6s linked to inflammatory diseases. I reach for Coconut Oil first, Olive second, and whenever I want that buttery flavor, I turn to Ghee. A good rule of thumb – anything butter can do, pure coconut oil can do (better). And healthy fats, like coconut oil, hemp and flax seed oil, walnut, almond and olive oil offer a wider range of benefits and unrivaled flavor than processed spreads. So check out the recipe below for my Vegan, Gluten-free Mashed Acorn Squash and plan to pair it with any of your favorite Vegetarian, fish or meat dishes that are simply grilled or use a basic Mediterranean or Indian spice. Cut acorn squash in half and drizzle with olive oil. Roast them cut side up on a baking sheet for 50 minutes or until the flesh is just tender. Let the squash cool for 20 minutes. In a large skillet over medium heat melt the butter and add the onions. Stirring occasionally, cook the onions for 10 minutes, or until they begin to brown at the edges. Mix in the garlic, coriander, and nutmeg. Cook the mixture 2 minutes more; then reduce heat to low. Spoon the seeds and stringy middle out of the squash, and discard these. Spoon out the flesh, chop it and add it to the onion mixture. Discard the skins. Heat and stir the squash-onion mixture, then season it with salt and pepper. Serve the squash hot. If you're making this with the Warm Apple Pork Chops, spoon some of the sauce from the pan right before you remove the chops and turn it to a glaze. Add sauce to the squash based on desired taste (I used 1 TBSP). 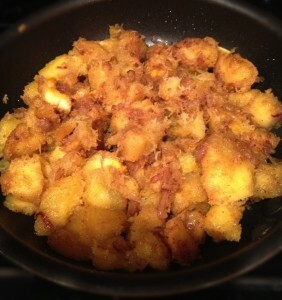 Alternate options: sauté 1/2 apple (peeled and cored) with 1 TBSP onions in coconut oil or ghee. Add 1/4 cup chicken stock or apple cider vinegar and simmer for 10 minutes. Use this sauce to add to squash to taste. Let me know once you try this; I’d love to hear some of your favorite squash ideas too! Butter in this recipe doesn't make this truly dairy-free and vegan. You can sub Ghee which removes most traces of dairy and dairy sensitive folks can typically digest it without issues. I’ll update the recipe to reflect that as an option! 3 Pings/Trackbacks for "Roasted Acorn Squash Mash (Gluten Free, Dairy Free, Vegan)"